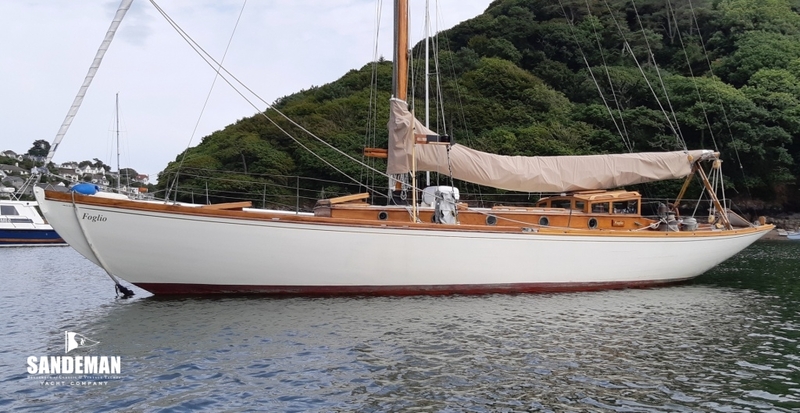 "Designed by Norman E Dallimore; built by William King” - it really doesn’t come much better, and this 42ft bermudan cutter is proof indeed. There is something very special about Norman Dallimore’s designs that can be hard to describe; they just look right - FOGLIO certainly does. Typically sweet lines and nicely understated style coupled with stout construction from superb materials have attracted a caring selection of owners for over eighty years - with a vacancy now appearing. You couldn't sail anywhere with FOGLIO without receiving admiring glances and comments. 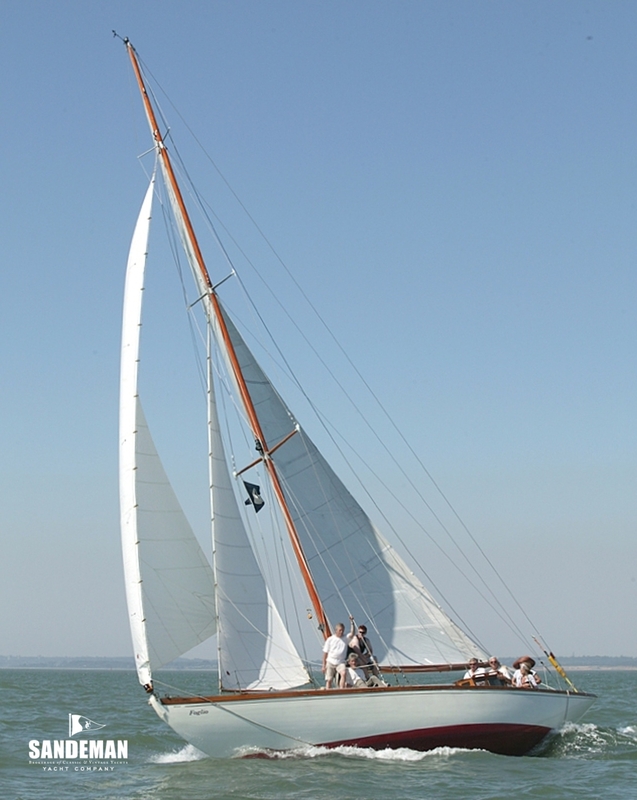 FOGLIO is a very fine example of the 'fast cruisers' resulting from designer Norman E Dallimore's rapport through the 1920s and 30s with his local Burnham-on-Crouch boatbuilding firm, William King & Sons. There is an element of romance involved in the Dallimore story. Apart from his yachts looking superb and sailing so well, part of the attraction must be his "part time" status. Like that other much loved part time English designer Albert Strange, who was a teacher by day, yacht design wasn’t Dallimore’s main occupation - he worked daytime as a fire insurance surveyor. Yet around the time of FOGLIO’s design and construction he had no less than seven of his designs in build. He must have been a very busy and organised individual. Dallimore’s client for fast cruiser design number 204 - a close sister to another well-known design from his board the same year, MARCHWOOD MAID - was highly decorated soldier, lawyer, and pioneering and influential systems scientist, (later Sir) C Geoffrey Vickers, VC. Funnily enough, his previous yacht was the Albert Strange-designed, Luke of Hamble-built yawl IMOGEN. Launched as ALLEGRO, under Vickers’ ownership she took part in pre-war RORC Points Championship races on England’s south and east coasts. But by 1939 she had changed hands. Perhaps Vickers already had an inkling that his special skills would be in demand for the organisation of another war. The new owners, Fred and Blossom Miles, would both design and build aircraft for the war effort organised by her former owner: the second world war saw Vickers involved at a high level - as Deputy Director General at the Ministry of Economic Warfare, in charge of economic intelligence, and a member of the Joint Intelligence Committee of the Chiefs of Staff. ALLEGRO survived wartime lay-up, and, keeping to the aviation theme, by 1947 had passed into the hands of leading aeronautical engineer Air Commodore William Helmore. Under his long ownership ALLEGRO would become a well-known Royal Air Force Yacht Club boat into the 1960s. From 1964 ALLEGRO enjoyed another settled period of ownership by London-based insurance broker Gilbert McNeill-Moss. JB Weir had her for a few years in the late 70s before a move to Holland. Then three Dutch owners and three name changes down the line: SCHOUWENBANK from 1982 with Joost Van den Post; back to ALLEGRO for Erik Le Clercq in 1987; FOGLIO from 1988 for Maarten Muntinga who stepped a new, taller mast and returned her to UK waters, where in 2001 her present owners became custodians. 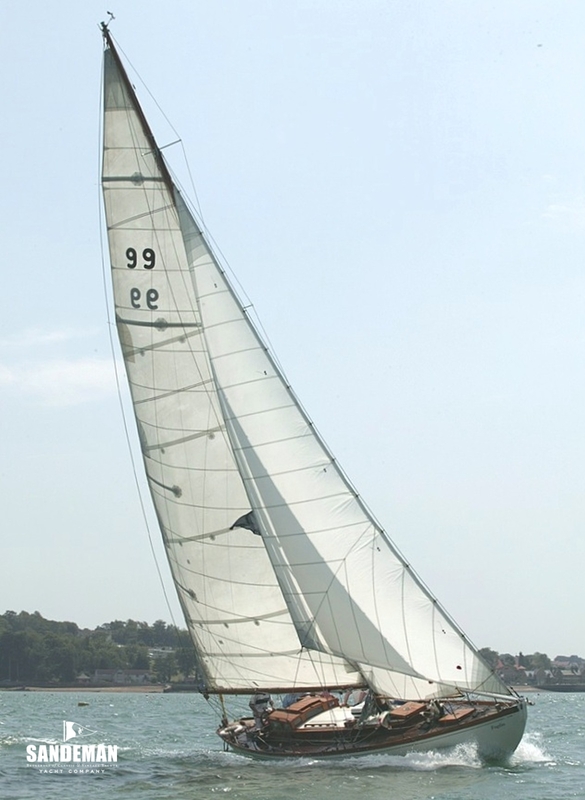 In more recent years FOGLIO has raced at the British Classic Yacht Club's Panerai Regatta and cruised extensively in English Channel waters. The owner’s ethos has been to keep/ return this beautiful yacht to its original form; only to enable the yacht to be sailed with greater safety was this intention sacrificed. - Renewed covering board and toe rail aft from amidships to stern. - Improved running backstay mounting. - EPIRB mounted in the heads for easy access.